Waystar partnership offers clients claims processing, remits, eligibility checks, paper claims processing, claim acknowledgements and real-time claim scrubbing through our seamless integration. Our industry-leading 98%+ first-pass clean claims rate and top-notch customer support have earned Best in KLAS® ratings every year since 2010 and #1 rankings from Black Book™ surveys since 2012. Our powerful network connects to over 4,000 payers, 450,000 providers across every care setting and 750 health systems and hospitals. Before we got Waystar (Zirmed), we would either submit the claims on paper (which is hard to track) or through the payers provider portal. We would need to maintain a dozen or so username and password for various websites. You would need to sign up for a lot of websites. With Waystar, all you need is one username and password. You can electronically submit claims to various payers with one click. Waystar will scrub the claim to see if there are any front end rejections. If the payer rejects the claim, you can correct it within Waystar without having to go back to the EMR and correct it. You can track your claims within Waystar. You can download an excel spreadsheet with the information you need. You have the ability to correct claims that get rejected by the insurance company. Waystar will scrub your claims even before they sent it off you the insurance company. The layout is very user-friendly and straight forward. If the Payer allows it, remittance advice can be downloaded and uploaded to the EHR software. Claims can be copied if you have to enter them manually. YOu don't need to reenter the whole patient information over and over again. Day to day insurance validity checks and billing that has a set price per bill instead per page. National address database check before sending bills to the wrong clinicAble to run my clinic day to day knowing that patients have valid insurance and possible deductible amount. Allows us to give best patient care without unknowing giving the patient a big bill that will be from care rendered and deductible amount. 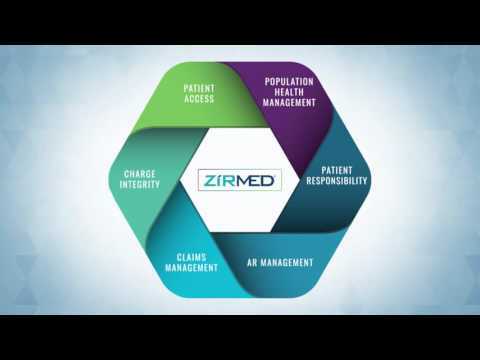 Zirmed increases my clinic's ability to inform patient of deductible amounts prior so that patient understands amount they may be billed and the reason for the bill. From this, it gives patients the autonomy in their care. Zirmed also has a billing service that allows for import from billing software with set prices per bill (not page) and it checks a national database with address to make sure the bill is going to the correct patient. efficient claims processing, denials management, great reports with comparrisons to others in the same industry.Their customer service lives up to the 3 ring rule. Customer service are very pleasant and helpful on the phone. If your question is beyond that department they listen to all of your questions or concerns and directly transfer you to the right person/department to help with your needs. I am been very happy with their live training. The videos for additional tools and training are very specific you are able to accomplish what you need to learn. I have found the sales team to be very accommodating when renewing products. I have found their fees for the credit card /Payleap to be the best prices out there. We were a fairly small practice when we started with Navicure (8 physicians) and grew to almost 30 providers. Navicure worked great even as we grew.The messaging system you can use for issues/questions is usually responded to pretty quickly, reps are nice via telephone also. Easy system, user friendly. Didn't require much training. it gives you the option to correct claims directly in Navicure, or cancel and resend from your billing system. Printable reports when needed, easy sorting. Please contact ZirMed for pricing details. • 98% clean claims rate. • Award-winning customer support, paired with investments into research and development that allow us to continuously innovate. • Waystar offers a patient notebook that enables healthcare organizations to accept debit or credit card payments, create flexible payment plans, and send emails with document attachments to patients. • Waystar enables hospitals & healthcare organizations to streamline accounts receivable workflows, review claim denial trends, and identify the insurance coverage of each patient to reduce write-offs as well as bad debts. • Waystar allows business executives to create customizable dashboards that capture information including key performance indicators, actionable insights, and other reports monitoring the important metrics. • The platform offers a Workcenter feature that enables managers to create workgroups where staff members can view only those claims on which they have to work. • ZirMed & Navicure enable hospitals and medical centers to create and print patient e-statements that organize key information points in a structured format for payment collection. Below are some frequently asked questions for Waystar. Q. What type of pricing plans does Waystar offer? Q. Who are the typical users of Waystar? Q. What languages does Waystar support? Q. Does Waystar support mobile devices? Q. Does Waystar offer an API? Yes, Waystar has an API available for use. Q. What other apps does Waystar integrate with? Q. What level of support does Waystar offer?